Ex-Presidents Truman and Eisenhower outside St. Matthew’s Cathedral after President Kennedy’s funeral, 55 years ago today. According to @ClintHill_SS, this picture was taken after they saw young JFK Jr. salute his father. On this day, Truman and Ike ended their 11-year feud. This Twitter message came from presidential historian Michael Beschloss, who posted it with this picture I am sharing here. The photo was taken at JFK’s funeral. 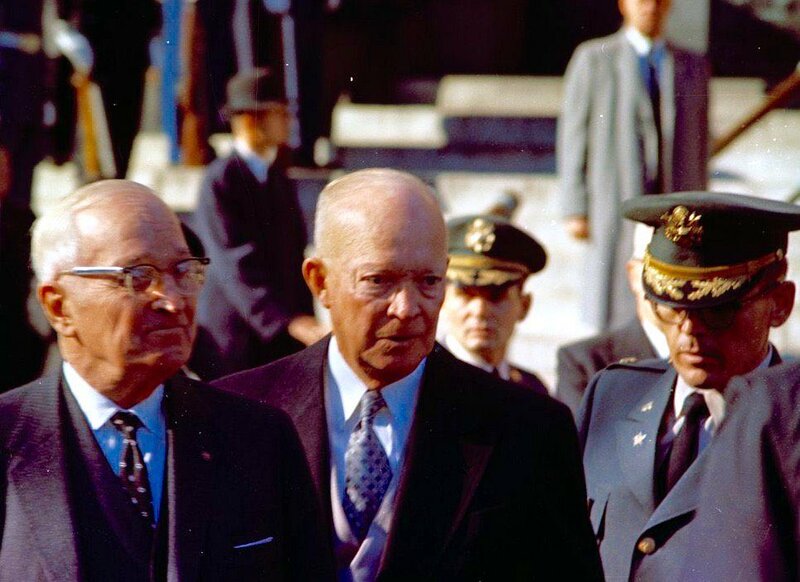 It shows his two immediate predecessors, President Harry Truman (left) and President Dwight Eisenhower. The “ClintHill_SS” referenced in the above tweet is the name of the Secret Service agent who climbed aboard the limousine carrying the president and first lady as gunshots rang out in downtown Dallas on Nov. 22, 1963. The two men disliked each other intensely. Their domestic and foreign policy differences became personal between them. Ike succeeded Give ‘Em Hell Harry in January 1953 and the two men barely spoke to each other for the decade that preceded President Kennedy’s brutal murder. Then the two former presidents came to pay their respects to their slain successor. And while there they buried the hostility they held toward each other. As Beschloss noted in his tweet, the picture was taken as the two men saw John Kennedy Jr. salute his father’s casket as it wheeled past him. I had learned long ago about the Truman-Eisenhower feud. It ended when they sat together and listened to the tributes to the young president who succeeded Ike in 1961. The youngest elected president was laid to rest and the two old warriors laid their antipathy toward each other to rest at the same time. It’s a long-forgotten, but still poignant testimony to the fragility of Earthly life. Ike and Truman got to live to become old men, something denied to JFK. The two presidents came to that realization when President Kennedy was laid to rest. It’s one of life’s most valuable lessons. Why now do we talk about POTUS and racial intolerance? I came into this world more than 68 years ago. My first memory of anything takes me back to when I was around 3 years of age. Over many of the next nearly seven decades I have been fairly politically dialed in. I have had a great interest in politics and public policy. I was able to shake Bobby Kennedy’s hand in May 1968, a week before he died at the hands of an assassin. I returned from the Army in 1970 and became a college campus volunteer for George McGovern’s failed campaign in 1972. I have been able to cover two national presidential political conventions. Thus, I must declare that this time in our history — during the presidency of Donald John Trump — is the first time I can recall such widespread discussion of whether the president of the United States is friendly to white supremacist hate groups. This upcoming weekend will mark the first year since the riot exploded in Charlottesville, Va., the incident that started with white supremacists protested the removal from a public park of a statue of Gen. Robert E. Lee. It got ugly. Counter protesters challenged the haters. A young woman died when she was run over in the melee; a young man associated with the hate groups has been charged with murder. Donald Trump has refused to condemn the white supremacists singularly. He has been virtually silent about the Klan and the neo-Nazis. I was born during the Truman years. My first presidential memory is of Dwight Eisenhower. Every single president from Ike’s era has not been the subject of this kind of discussion. Until now. Trump has broken the mold. He is the first president in my lengthy memory who continues to be associated in the minds of many Americans with those who espouse the kind of violence that the rest of us condemn with a full-throated roar. We are witnessing a scary precedent coming from an equally scary president. Nagasaki: That bomb ended it! The United States Army Air Force dropped a second big bomb 73 years ago today. That one exploded over Nagasaki, Japan. 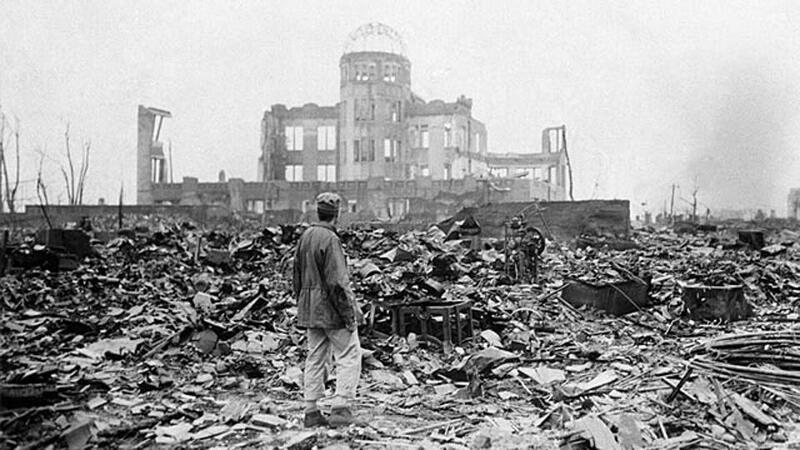 The first big blast, at Hiroshima, didn’t bring Japan to the surrender table. The second one did. The atomic age had entered the world of warfare. It was called the Manhattan Project, where some of the world’s most brilliant nuclear physicists worked to perfect the atomic bomb. The United States had been at war with Germany, Italy and Japan for nearly four years. Germany surrendered in May 1945; Italy called it quits in 1943. Japan was left as the remaining Axis power. President Truman, new to the office he inherited when President Roosevelt died in April 1945, had the most difficult of decisions to make: whether to use this terrible new weapon. He went with his gut. Yes, drop the bomb and hope to save many more lives than will be lost. That calculation proved accurate, too. 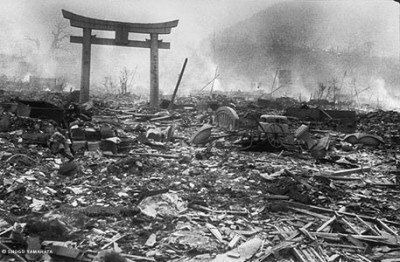 Nagasaki was devastated on Aug. 9, 1945 by an even bigger bomb than the one that leveled Hiroshima three days earlier. Less than a week after Nagasaki was incinerated, the Japanese surrendered. President Truman said he didn’t regret deploying the bomb. Many of the great men who developed it had second thoughts. The likes of Robert Oppenheimer, Enrico Fermi and Albert Einstein eventually expressed some form of regret for their roles in developing this monstrous weapon. We all hope never to use them again. Twice was more than enough. I’ve made this point already, but I feel the need to restate it. Donald J. Trump once again referred to the secretary of defense as “Gen. Mattis.” Yes, James “Mad Dog” Mattis — one of my favorite Trump Cabinet appointees — is a retired Marine Corps general. He’s got four stars on his epaulets. But that was then. Today, the here and now, Mad Dog Mattis is a civilian, just like the president is a civilian. Trump’s reference to “Gen. Mattis” came as he was announcing his decision to sh**can the planned June 12 summit with North Korea’s Kim Jong Un. The president, naturally, followed that reference with a statement that the U.S. military is the strongest in the world and that it is ready to act if the need arises. Mr. President, we assign these Cabinet posts to civilians. It’s a time-honored tradition that civilians control the military. President Truman had to remind Army Gen. Douglas MacArthur of that fact when he relieved him of his Korean War command in the early 1950s. I know it’s a semantics issue. 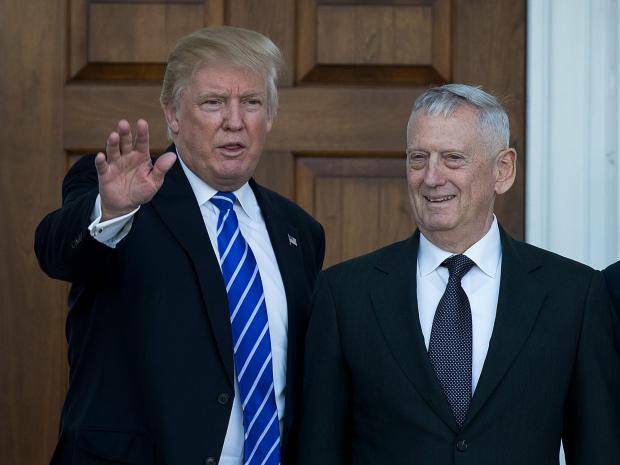 It just bothers the daylights out of me that the commander in chief cannot honor the long-standing tradition of the office with a simple reference to the defense boss as “Secretary” James Mattis. Get with the program, Mr. President. Donald J. and Melania Trump are accustomed, I presume, to some pretty sumptuous living quarters. They’re accustomed to glitz and glam, of which they have plenty at their various homes in New York, south Florida and New Jersey. They have taken up part-time residence in an old house at 1600 Pennsylvania Ave. Trouble is, though, the president thinks it’s a “real dump.” He made the remark to golf pals; Trump, as is customary, denies saying it. Hey, not to worry. The first couple and their young son are now spending the next 15 or so days at their golf club in New Jersey. The “dump” in D.C. is getting a little fixup while they are away: a new heating and air conditioning system and some nips and tucks here and there throughout the residence. 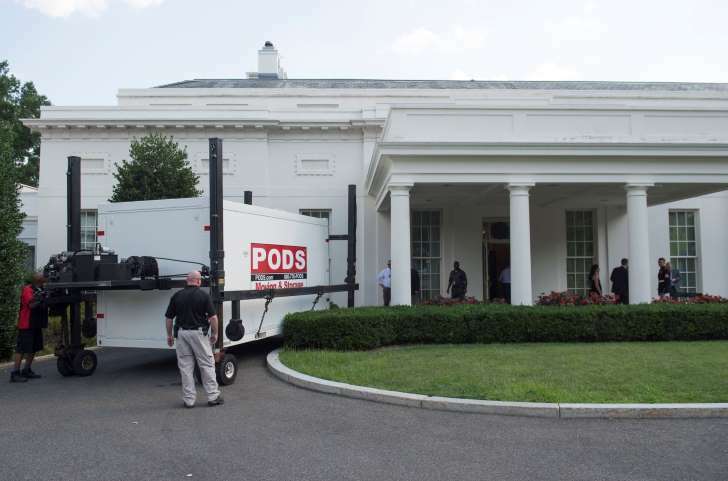 Still, for millions of Americans who’ve seen the White House up close — as my wife, sons and I have been honored to do — the “real dump” comment is offensive to the core. It’s been the home for presidents since John Adams. Yes, it got burned during the War of 1812. Presidents since that time have been forced to fix things up at the place. President Truman moved into the Blair House with his wife and daughter while crews repaired some flooring. President Clinton had some asbestos issues. The White House has been plagued by flies on occasion, too. It’s not a “dump,” let alone a “real dump,” as Trump has called it. Read more about the “dump” issue here. Sure, the place is old. It needs repair on occasion. A “dump”? Hardly. It’s filled with history and its walls contain portraits of all the men and women who have called it home. If only the current president could appreciate it. Maybe he will if the heating and AC are in proper working order when he returns from his vacation. Seventy-two years ago today a single U.S. Army Air Force bomber dropped a single bomb on a Japanese city and ushered the nuclear age into modern warfare. 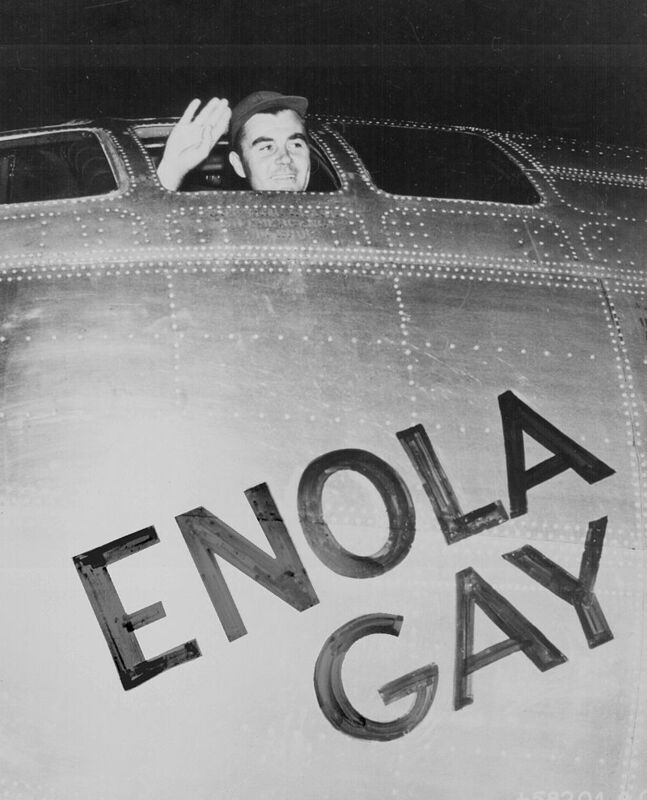 The plane was called the Enola Gay, named after the mother of the bomber’s commanding officer, Col. Paul Tibbetts. The place was Hiroshima. The atomic bomb killed many thousands of Japanese civilians — quite literally in a flash of light, heat and unimaginable concussive force. Aug. 6, 1945 has gone down in history as arguably the most compelling moment of the 20th century. American air power would drop another atomic bomb three days later on Nagasaki, Japan. The Japanese would surrender a few days after that and World War II would come to an end. The debate has raged for seven decades: Should we have dropped the bomb? Did we have to kill so many Japanese civilians? Would the Japanese have surrendered without having to suffer such horrific destruction? I have some proverbial skin in that argument. A young man was stationed in The Philippines when the bombs fell on Japan. He was serving in the U.S. Navy and well could have taken part in the invasion of Japan had it occurred. We also well might have died in the effort, denying him the chance to return home and start a family that resulted in, well, yours truly being born. 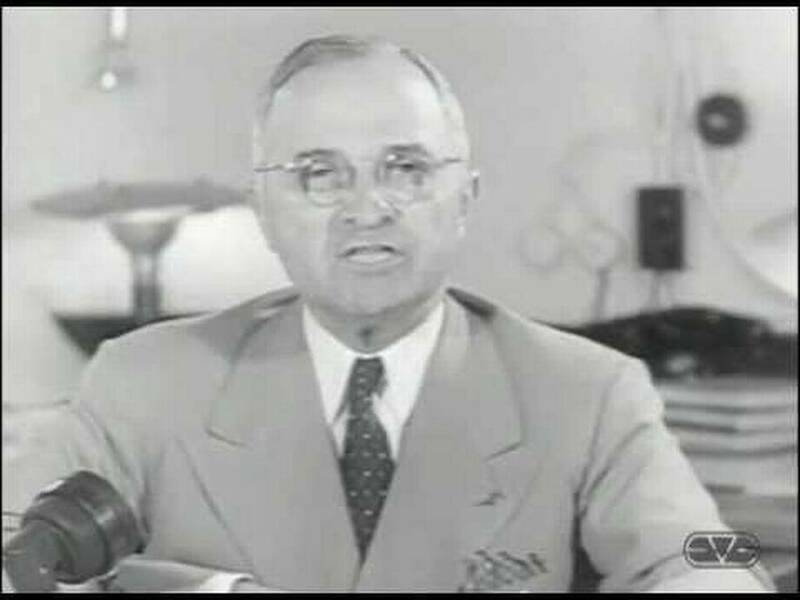 President Harry Truman had been in office only since April 1945; he assumed the power of the presidency upon the death of President Franklin Roosevelt. He only learned about the A-bomb development after he had taken the oath. The newly minted commander in chief was handed some information that could have shortened the war by weeks, maybe months. Yes, the option before him would cost a lot of Japanese lives and he knew that at the top. He had to make a stern choice: Do I deploy this weapon knowing the destruction it will bring to the enemy’s homeland or do I risk sending our young men into battle at the cost of many thousands of American lives? The president knew the consequences of the choice he had to make. In my mind — and in my heart and gut — the president made the correct call. I cannot be objective or analytical about this. It’s personal, man. Well now. 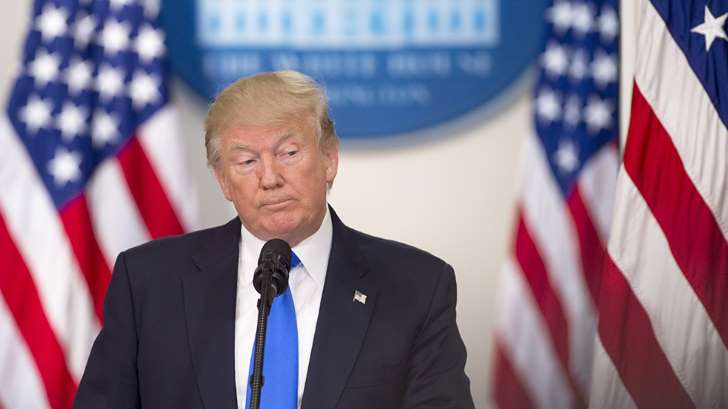 Donald Trump is tweeting something about “repercussions” if Senate Republicans fail to enact a health care insurance overhaul that would “repeal and replace” the Affordable Care Act. This must be what the president means when he says he won’t “own” any failure to approve this legislation. I believe the president must own it. He must take responsibility. He is the nation’s top Republican — even if he is a Republican In Name Only, aka a RINO, in the hearts of many true believers. That’s not how sees it. He’s now suggesting via Twitter that he’ll somehow punish Republicans on Capitol Hill if they fail to do his bidding. First things first. He needs to offer some detail on what his bidding entails. What does he want, specifically, in a health care overhaul? Oh, I almost forgot. The president is just too damn busy “making America great again” to worry about the details of legislation that aims to affect one-sixth of the American economy. The Congressional Budget Office doesn’t like the GOP plan. It will cost millions of Americans their insurance plan and it cuts too much money from Medicaid, which enables Americans to afford health insurance. 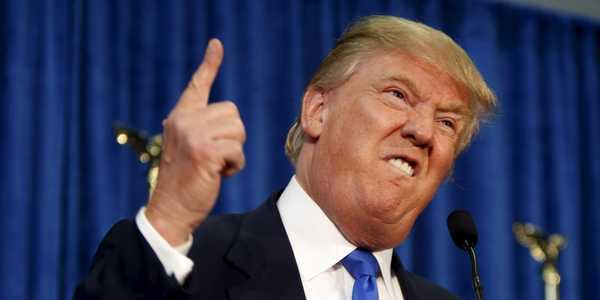 Just as President Truman famously posted the sign on his desk proclaiming “The Buck Stops Here,” Donald Trump is now infamously declaring that others will pay the price for his own failures as head of a once-great American political party. In my humble view, presidents don’t earn their tickets into the pantheon of greatness by refusing to “own” their mistakes. The GOP health care plan is a doozy of a mistake, Mr. President. It’s on you.